I remember being concerned about it more than 40 years ago. How could God command his people to murder everyone living in each Canaanite city that they captured? And I am not the only one to feel revolted by these commands in the book of Deuteronomy and the accounts in the book of Joshua. Critics of christianity commonly point to these episodes as evidence that the Bible, and God, should not be believed or respected. They obviously have a point. How can anyone worship a God who commands genocide? But did God give these commands? Did the bloody warfare described in Joshua actually happen? I have read what some of the best historians have to say about the period, investigated the Bible beyond the Joshua account (Did God really order the slaughter of the Canaanites? ), and found that (unsurprisingly) this is a complex matter much argued over. To answer this question, we must understand this part of the Bible in its historical context. Instead of making an assumption (which readers may or may not share) about whether the book of Joshua is historically accurate, I have looked at what ancient history and archaeology can tell us about this period in Israel’s history and compared this to the picture provided by an overview of Joshua and the following Biblical book, Judges. At first sight, the Bible and archaeology don’t agree, but when we look closer, they share much in common. Here is a summary of what I found (for more detail, check out Did God really order the slaughter of the Canaanites?). The archaeology shows that large-scale genocide didn’t occur. The evidence supports the idea that a small group of refugees from Egypt settled in Canaan (not a large group as portrayed in the Bible) and over several centuries assimilated with the local Canaanite population and established the nation of Israel. Warfare and killing did occur and many cities were destroyed or captured, but the incoming Israelites were not responsible for all this. The destruction was on a smaller scale than a literal understanding of Joshua suggests. Some of the stories in Joshua seem to reflect a later time. The Bible presents two different pictures of these events. Joshua 1-12 is an idealised, hyperbolic and not really historical account of total destruction that needs to be understood in its cultural context – at that time accounts of warfare and destruction were often highly exaggerated. But the remainder of Joshua and the book of Judges shows that the Israelites only gained control gradually, with much less fighting and destruction. Several cities said in Joshua 1-12 to have been conquered (e.g. Jerusalem, Megiddo, Gezer), are recorded later in Joshua as not being captured then, and the full Israelite takeover took several centuries, as recorded in Judges, Samuel and Kings. This second picture agrees much more with the archaeology. We can choose between two views of this part of the Bible. Despite the obvious inconsistencies in the text, we can hold to the accuracy of the Bible and paint a very unloving and harsh picture of God as commanding whatever level of killing occurred. Or we can accept that the Bible includes two different versions of events, contains exaggeration and legend, and reflects the beliefs of the time. And so it attributes to God actions that God wouldn’t have approved of. The historical evidence shows that the Bible is not always literally historical and tells two different stories. It seems best to see the Bible as progressive revelation, with this being a very early stage in that process. I think it is abominable to attribute these commands and actions to the God of Jesus, who spoke out against violence. I conclude that the genocide didn’t happen, nor did God command it. I conclude that the commands and events recorded in Deuteronomy and Joshua are not an argument against God, but against a particular doctrine of the Bible that doesn’t fit the historical and Biblical evidence. See a map, the relevant Biblical passages, and a list of references, in Did God really order the slaughter of the Canaanites? Graphic: Free Bible Images. This graphic shows the inhabitants of the city of Ai chasing the Israelites after an unsuccessful attack. 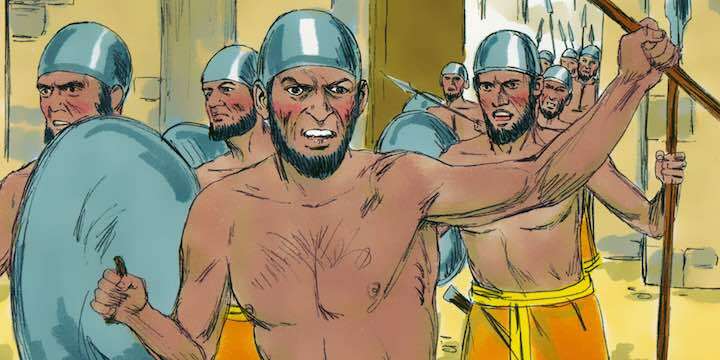 There is some doubt about whether Ai actually existed at the time of Joshua, and the graphic may be anachronistic, as it appears to show the Canaanite soldiers wearing iron helmets, whereas this was still the Bronze Age, and neither the Canaanites nor the Israelites had iron weapons at this time. Does God heal and speak today?